Mrs. Irene Everton Blount, 95, of Jamesville, NC passed away peacefully surrounded by loved ones on Wednesday, November 30, 2016 at River Trace Nursing Home in Washington. Mrs. Irene was born February 16, 1921 in Tyrell County to the late Samuel and Della Patrick Everton. She deeply loved her hometown of Gum Neck and adored her siblings, Russell Everton, Harry Everton, Azor Everton, and Lula E. Tucker, who all predeceased her. Mrs. Irene graduated from Columbia High School and Norfolk Business College. After High School she moved to Jamesville which became her beloved home for the rest of her life and where she was swept off her feet by P.C. "Tee Wee" Blount. Mr. Tee Wee and Mrs. Irene were happily married for 63 years until his passing in 2005. Mrs. Irene loved people and will forever be remembered for her kind spirit and sweet smile. Mrs. Irene blessed everyone she met whether it was through her years working at the rationing board during World War II, selling Avon door to door in Jamesville, delivering you a pie or cheese and macaroni during a time of need, or working alongside her husband at their store, The Friendly Grocery, until they retired in 1990. 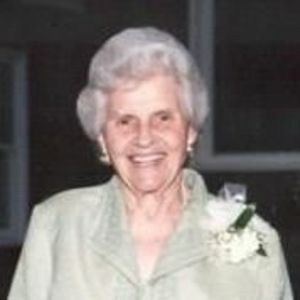 Mrs. Irene cherished her Jamesville community, was a kind neighbor, and was always willing to serve. She was an active member of the Jamesville United Methodist Church and the Jamesville Women's Club. It was behind the scenes where Mrs. Irene truly shined. She proudly stood beside her husband enabling him to be the fisherman, businessman, fire chief, church leader, and community member he was. She was a dedicated, loving, and honorable wife, mother, aunt, grandmother, and great-grandmother who leaves behind a legacy of integrity, love for family, community, and Christ and His church. Mrs. Irene was predeceased by her parents, husband, siblings, her son-in-law Joe B. Griffin, and a granddaughter, Meredith Griffin Revels. Surviving are her children, Phil Blount and wife Jane and daughter, Gwen Manning and husband Norman all of Charlotte, as well as daughter Mary Charles Griffin of the Farm Life Community. Other survivors are grandchildren; Mary Gwen Russ (Scott), Joey Griffin, Martha Anne Hyman (David), Candi Manning (Steven), Philip Blount, and Jameson Blount. Mrs. Irene was so proud of her 6 great grandchildren Brandon Russ, Caleb & Noah Hyman, Berkley, Meredith, & Elizabeth Manning as well as her surviving nephews and nieces who were very precious to her heart. The Family will receive visitors at Mrs. Irene's home at 1115 Saint Andrews Street in Jamesville. A visitation will be held on Saturday, December 3rd at 1:30pm at the Jamesville United Methodist Church with a memorial service following at 3pm. Memorial gifts can be made to Philip's Academy (3115 Providence Rd., Charlotte, NC 28211), Jamesville United Methodist Church, or Jamesville Fire & Rescue. Arrangements handled by Biggs Funeral Home of Williamston.